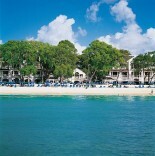 The luxurious Sandy Lane resort is located on the west coast of Barbados, 8 miles/13 km from Bridgetown. Grantley Adams Int'l Airport is 17 miles/27 km or 30 minutes away by chauffered limousine transfer. Sandy Lane is one of the most luxurious and preferred resorts in the Carribbean, renowned for its state of the art service, facilities and culinary excellence. At this world class resort, guests can be as active or relaxed as they wish. Sandy Lane is the ideal romantic getaway for couples and those seeking peace and seclusion and also caters to families desiring a holiday filled with a range of leisure activities including use of the immense three level pool complex with a terraced hillside and rock-grotto waterfall. 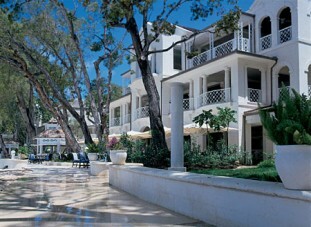 Sandy Lane is perhaps most well known for its luxurious and private villa - The Sandy Lane Villa. The villa is 7300 square feet in size and has it's own private access to the beach. For more information on the villa please see side menu - "Sandy Lane Villa". The hotel fronts onto a quarter mile beach of sugar-white sand dotted with umbrellas and luxurious lounge chairs. A two-storey health and beauty spa offers exceptional facilities and the resorts second floor fine dining restaurant is an ideal spot for Carribbean sunsets. Golf enthusiasts will be delighted with the numerous championship golf courses, 450 yard driving range and immense clubhouse. Averaging 900 sq ft, rooms at Sandy Lane are ultra luxurious, featuring a plasma wide screen TV, interactive entertainment system, multi spray showers, heated mirrors in the bathroom and large private verandahs. 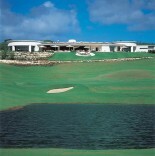 Activities include a Golf driving range, Jet skiing, Kayaking, Sailing, Water skiing, Windsurfing, Snorkeling, Boating, Surfing/boogie boarding, Tennis, Country Club facilities, 45 holes of championship golf, 47,000 sq ft/4366 sq m spa with 14 treatment suites, a free-form swimming pool and nine floodlit tennis courts. Child care services for toddlers to teenagers are also available.